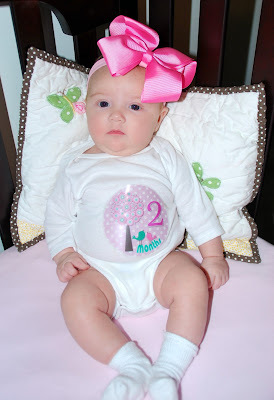 Today we had Presley's 2 month check up! I was a little nervous because I knew she'd be getting shots. We are on the delayed/alternative vaccine schedule (I think the one we go by is Dr. Sears?!) so I knew she wouldn't be getting too many. She only had one poke and one oral! The shot that she did get was a combination of DTaP(diphtheria, tetanus, and pertussis), IPV (polio), and Hep B. 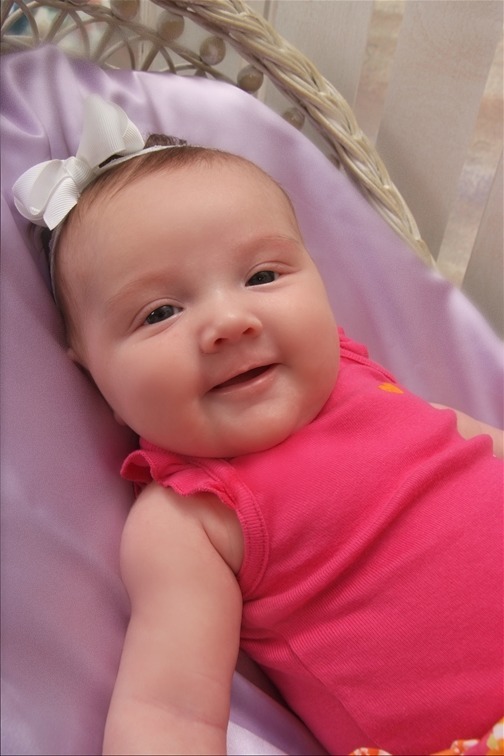 Then she had the vaccine for Rotavirus orally. She just squealed really loud, then continued to drink her bottle! 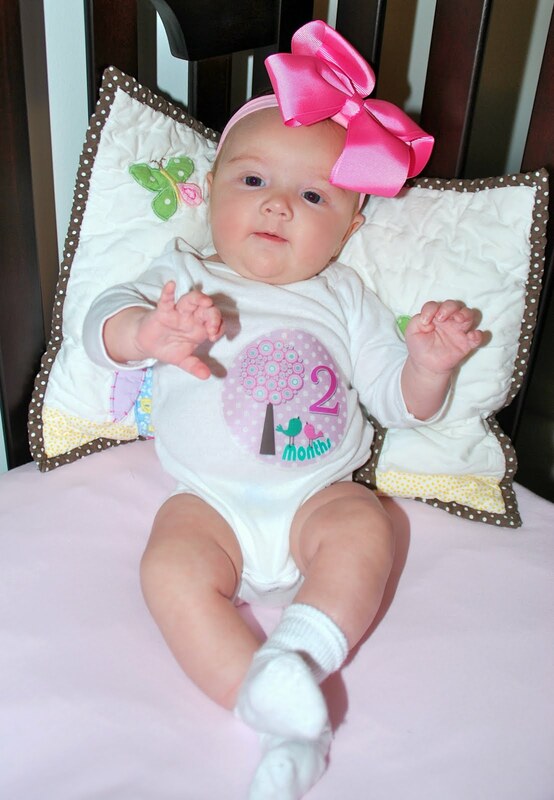 I am so glad we are doing the delayed shots, I can't imagine her getting 3 or 4 shots in one visit! We will go next month and get the other two she was supposed to have today! I've been giving her Tylenol every 4 hours so hopefully she won't run a fever or get too fussy! Homegirl has definitely grown since last month! The little booger is up to 12 pounds even! The doctor said her legs are a little skinny but if you ask me I hope it stays that way for the rest of her life! Adam has long skinny legs, so maybe P will also have a little more Betty to her spaghetti if you know what I'm sayin'. The NB clothes have been packed up and put away. 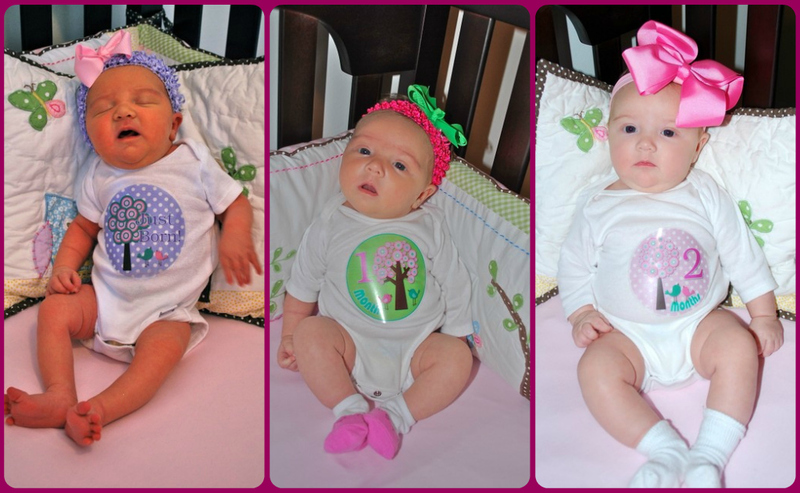 She is now filling out her 0-3 month clothes nicely which makes her wardrobe much bigger these days! Too bad we have nowhere interesting to go during the day! Oh well, she looks cute for me most of the time! By the way..if you live in T-Town, before you go shopping at the mall or Target you have to hit up the America's Thrift Store. I hit the jackpot in the baby clothes section the other day. Most everything I got it all Target brand clothes and it all looks new! Babies grow so fast that they don't have time to wear things out and make it look old. I think the most expensive item was $2.98 and it was a nice jacket for the winter. She's wearing size one these days! And can I just say, I hate Pampers diapers. 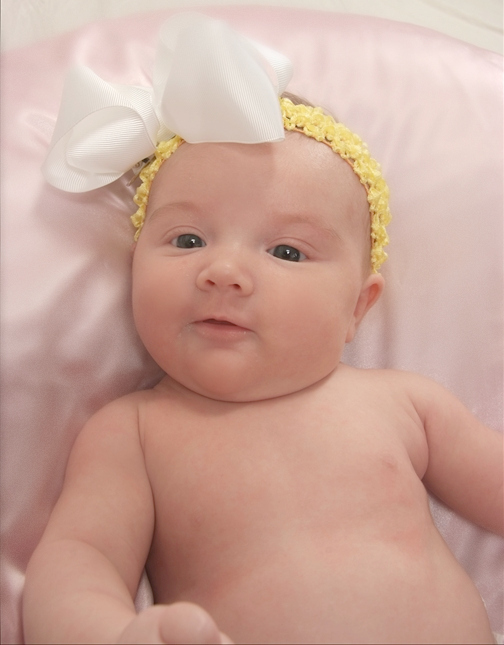 Huggies all the way for this nugget! I can't tell you how many Pampers little side tabs have ripped off while putting the diaper on. Also the Huggies are a lot thicker and hold more! One reason why I don't think Presley is my child...she is the worlds. slowest. eater. I eat like someone is about to come take my food away and never give it back. Seriously, if me and you ever go out to eat together I will have finished almost half of my meal by the time you get the napkin in your lap and the straw in your drink. It's retarded how fast I eat. Anyways..sorry ADD got me there. Presley is eating about 4-5 ounces ever 3-4 hours. Last night I put rice cereal in her bottle before bed and she slept 5 hours straight! HOLLA! I had stopped putting cereal in her bottle last month but am going to start doing it at night again. She hasn't lost any hair. It's still light brown and her eyes are still blue. I think her eyes are getting a tiny bit lighter though! Well, we started our strict new routine only a few nights ago but it's working and getting better. Last night she went from 11:00-4:00, I fed her, then she went back to sleep from 4:30-7:30! She usually sleeps for most of the day. She wakes up to eat and stays awake for about an hour and a half then is back snoozing! I am having a really hard time not getting sleep at night. It takes about 30-45 minutes to feed her and then by the time I get back to bed I don't get much sleep. To say I am ready for her to sleep thru the night is an understatement! She still loves bath time! Still hates getting out though! I would say her favorite thing right now is her swing. I feel like she stays in there for so much of the day but when I take her out to snuggle her she gets fussy and wants back in the swing! I guess I should be glad that it's not the opposite way around! At least I can get things done around the house (HA! yeah right) without having a baby attached to me! The weather has cooled off so we have been taking little walks around the 'hood! This morning it was actually really cold! 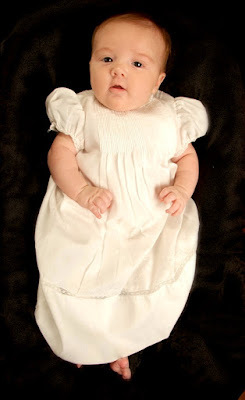 Also, my Mom and I took her to get her pictures made (we actually took her when she was 7 1/2 weeks old). My Mom still has a bunch of my dresses from when I was a wee lil' lad and so we took Presley to get her picture taken in one of the dresses. 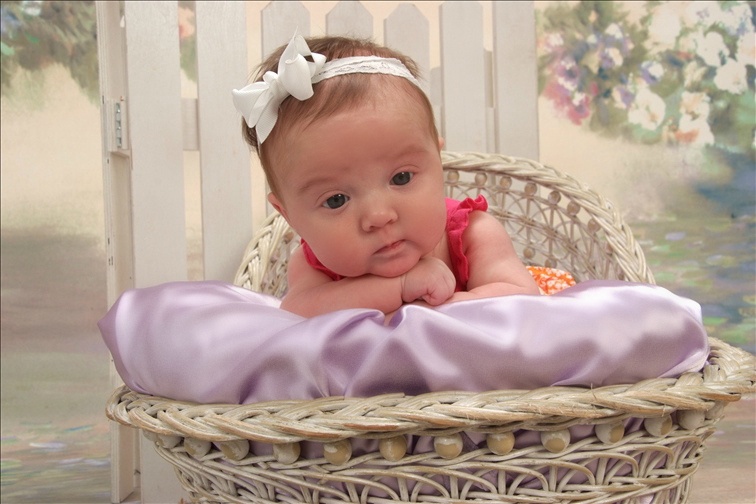 We just went to a cheap little place in town (Portrait Innovations) because you really can't beat their prices. We got SO many pictures in all different sizes, and a CD with every picture they took and it was only $100..thanks Nana Nessa! The whole reason of going was to get her picture made in this dress!